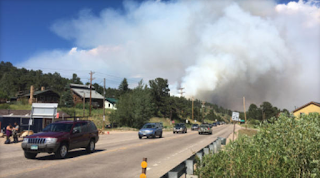 Two men from Alabama were arrested for their role in starting the Cold Springs Fire near Nederland in Colorado. Jimmy Suggs and Zackary Kuykendall were charged with fourth degree arson. The sheriff's office said the men face felony arson because lives were endangered as a result of the fire. Fire investigators and detectives said they were able to determine that the fire started at an ad hoc campsite near the Peak to Peak Highway and Cold Springs Road. The fire from the campsite was not properly put out, and it continued to smolder because of the wind and the hot, dry weather. Apparently, the men tried to put out the fire by putting dirt and rocks on top of it. The wildfire destroyed eight homes, and a couple thousand people were forced to evacuate their homes. 200 firefighters were on the ground and 12 aircrafts fought to contain the fire.